Chromium is using 2 cores and Opera isn’t running full speed on Sunspider JS benchmark. That is the outcome of a simple test running TOP while taking the sunspider benchmark on a quadcore (AMD 630) Ubuntu 64 machine with the three main browsers: Chromium, Firefox and Opera. Opera 11.11 is surprisingly never using more then 80% CPU while Firefox 4 is using 100% and Chromium 12 150%. A quadcore can take 400%, when all 4 CPU cycles are fully utilized. Opera is the slowest performer on the benchmark, no surprise and Firefox is somehow disabling graphical output: nearly no load on X-server, and no visual graphical output, while Opera and in a lesser extent Chromium show a lot of flickering and flashing. 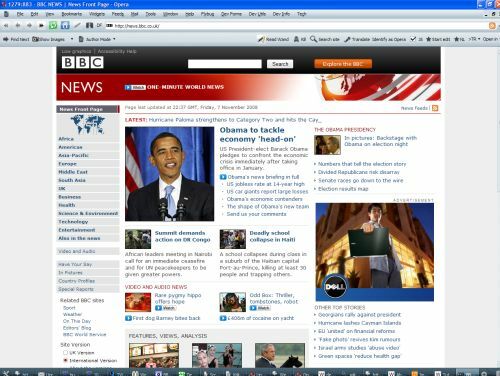 Opera is also putting a bigger load on Compiz, the compositing window manager for Linux, AKA 3d eye candy. But Opera, as said before, is also giving more visual feedback about downloading files and stuff with an animated icon in the addressbar. Seems that Opera isn’t going full throttle on benchmarks. I wonder why that is. Chromium is the only browser that is using multiple cores, but it isn’t actually much faster than Firefox. Another interesting thing is that Chromium feels the snappier browser but actually is stressing your PC more. The new HTML5 CANVAS element gives the developer pixel-poking magic. Poke and peek are functions from the good old days that offered the only geeky way to set and read-out individual bytes in the (graphic) memory. Sure things are better nowadays. To understand how canvas works, imagine an IMG element, of which every pixel can be set individually or loaded from a IMG source. This means you can filter images, copy them, translate, rotate, scale, in short: a lot. It can also add drop-shadow, although at the moment this is only fully supported by Safari and partially by Opera. Probably Firefox will add support in the upcoming 3.1. Rendering is best in Opera and Firefox. Safari and Chrome look awful. Webkits’ canvas seems designed to work only with integers while Opera and Firefox translates floats into some anti-alias rendering. Better but probably slower. Opera’s rendering is quite slow. Opera and Firefox look fine, Chrome’s rendering is jagged.